White House chief of staff John Kelly did not seem to be much of a fan of Hope Hicks, the outgoing communications director. White House chief of staff John Kelly did not think much of outgoing communications director Hope Hicks, as a New York magazine profile revealed. A former senior White House official told New York’s Olivia Nuzzi that Kelly was “extraordinarily dismissive” of Hicks and didn’t understand her role with President Donald Trump, whom she had been working with since the first days of his presidential campaign in 2015. Kelly sometimes blamed Hicks for habits Trump developed over the course of his life, Nuzzi wrote. Hicks announced her resignation last month following her testimony to the House Intelligence Committee. She reportedly said she had occasionally told white lies for the president but never lied about anything consequential related to the investigation into Russian interference in the 2016 US election. Her resignation also came after the abuse scandal surrounding former White House staff secretary Rob Porter, whom Hicks had dated. It was originally reported that Hicks helped craft the Kelly’s response to reports of allegations of domestic abuse against Porter. One of Porter’s former wives provided the Daily Mail photos of a black eye she said Porter gave her, while another provided a photo of a protective order she filed against Porter in 2010. Porter has denied the allegations. Kelly came under fire for his initial statement, in which he said Porter was “a man of true integrity and honour” whom “I can’t say enough good things about.” He later issued a second statement denouncing domestic violence, but still offered supportive words for Porter. 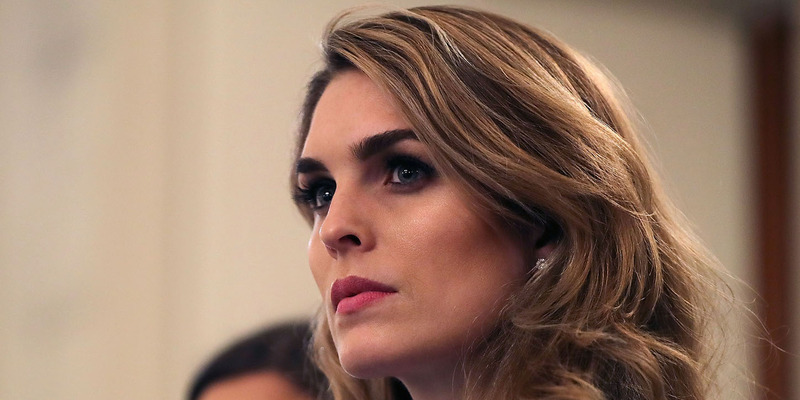 As Nuzzi wrote, the reports that said Hicks was involved in crafting the statement noted that her involvement was seen as a problem within the White House. Trump was reportedly frustrated with her. But five senior White House officials told Nuzzi that Hicks was not involved in crafting the statement. Kelly, they said, dictated it himself. But Kelly did not try to correct that reporting, letting Hicks take blame. Hicks’ proximity to the president concerned Kelly.